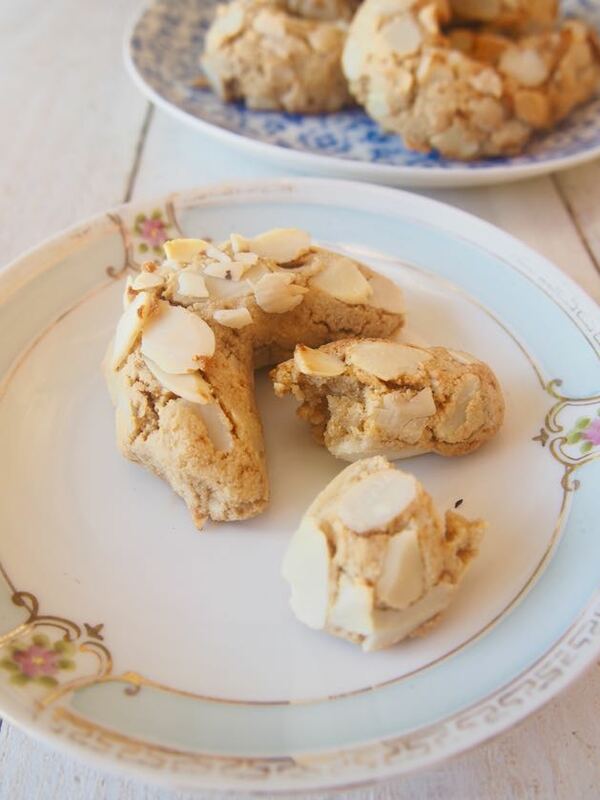 Paleo Greek Almond Biscuits (Paleo Amigthalota). We’re half Greek… did you know that? Well, maybe it’s like a quarter, because our dad was born in Australia but both his parents were born in Greece. So is it a quarter? Or half? Either way, we embrace our greekness mainly through food, we freaking LOVE greek food (olive oil, garlic, seafood, cloves, garlic (yes we meant to write that twice) and the treats, oh the treats… we also love the greek islands, we’ll embrace those too… and I guess we kinda look greek, we can’t control that but it is just another way we embrace our greekness. One time when we were on the island of Paros we bought a box full of greek treats that were supposed to last us the entire rest of our 10 day island hopping trip. Except that when we got back from a night of dancing Carla ate every single treat. Oops. 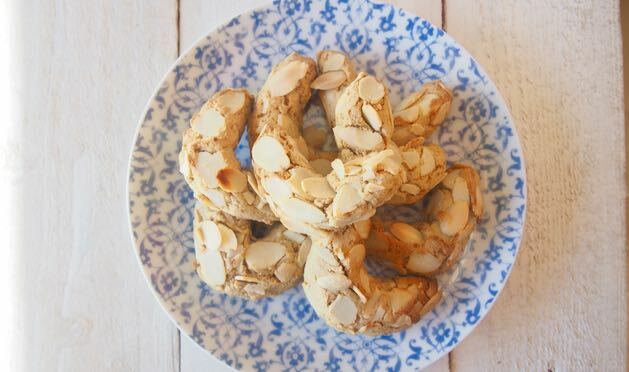 But get excited because we made Paleo Greek Almond Biscuits… also known as Amigthalota. And the best freaking thing about these biscuits is that they’re delicious. The second best thing is that you only need 4 ingredients to make them… say what?! True story! AND they only take 15 minutes to make. 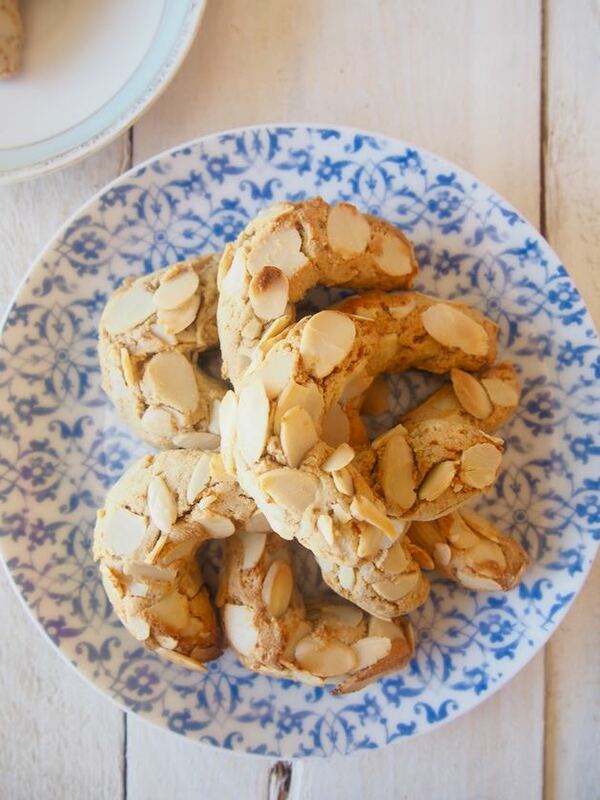 So if you start right NOW you’ll have Paleo Greek Almond Biscuits in like… 17 minutes! Go on! You’ll love them! p.s join our Make Life Merry Summer Program! 4 weeks of meal plans, shopping lists, expert webinars and an epic private Facebook group! Preheat oven to 180°C (350°F) and line a baking tray with baking paper. In a large bowl mix the almond meal and coconut sugar together. Add the egg whites and mix until a sticky dough forms. Take tablespoon fulls of mixture and roll in to balls, coat in flaked almonds then roll out between your hands to 8cm (3 inch) logs. Curve the log in to a crescent shape and place on to the prepared tray. Continue until all the cookie dough is used. Place in to the oven for 13-15 minutes or until golden. Allow to cool and ENJOY! What if we added choc chips?! GREAT IDEA!